Mercedes Benz is promoting the automotive company’s experiments with F-CELL hydrogen technology in “Invisible”, a project involving a vehicle which seems to blend into urban and rural scenery. Earlier Mercedes used digital cameras and billboards to help people see around dangerous corners (see here). Now they’ve placed mats of LED displays on the driver side of a vehicle, with a Canon EOS 5D Mark II digital SLR camera on the opposite side, making it seem as though the car isn’t there. 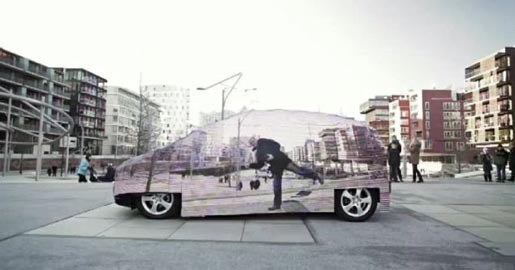 A video, promoted by popular site Mashable, shows the transparent car being driven around Germany by a Mercedes-Benz representative. As the car moves along the road the As the car moves along the road, the LED lights periodically fade to black and display a text advertisement, “Für die Umwelt unsichtbar. F-CELL mit 0,0 Emissionen” (Invisible to the environment. F-CELL with 0.0 emissions). The Invisible campaign was developed at Jung von Matt/Elbe, Hamburg, by executive creative directors Thimoteus Wagner, Fabian Frese, Götz Ulmer, creative director/art director Jonas Keller, creative director/copywriter Michael Ohanian, creative director Martin Strutz, designer Daniel Soares, account team Sven Dörrenbächer, Sonja Stockmann, Kete Stodtmeister, Ann-Kathrin Geertz and Nelli Walker. Filming was produced at Markenfilm-Crossing by director Daniel Schmidt, director of photography Jakob Süß, producers Martin Schön and Tina Rentzsch, programmers Bettina Ackermann and Christopher Schultz.